Este Expert Advisor pega movimentos rápidos no preço de um par de moedas e abre posições na direção do movimento. A funcionalidade é a mesma da versão para o MetaTrader 4. Ela inclui stop loss, take profit e um sistema de média. Monitoramento das contas que trabalham com o sistema. Versão completa do produto: Exp-TickSniper MT5 FULL. Nota: a versão demo não possui parâmetros de entrada ajustáveis. Lot = 0.01, todos os outros parâmetros são definidos para os padrões. Ele usa apenas um par de moedas para negociação - EURUSD. O strategy tester não é adequado para testar este Expert Advisor! Devido a algumas razões técnicas ele deve ser verificado apenas em tempo real. O sistema baseia-se na velocidade de ticks vindo vindo do MetaTrader 4 - MetaTrader 5. O sistema determina automaticamente os níveis para colocar as ordens, a velocidade dos próximos ticks, a distância das ordens adicionais e para o rastreio do lucro. OnlyModify- função que permite que o Expert Advisor trabalhe no modo de rastreio da posição atual, sem abrir novas ordens. Timeope - O período em milissegundos que é utilizado para verificar os sinais do Expert Advisor. Quanto maior for o valor, será mais frequente a geração de sinais de qualidade inferior. DistanceTickSpred - O número de spreads que o preço deve ir durante o tempo Timeope para que o Expert Advisor gere um sinal. TakeProfitTickSpred - O número de spreads do par de moedas para a colocação de um take profit para todas as posições. 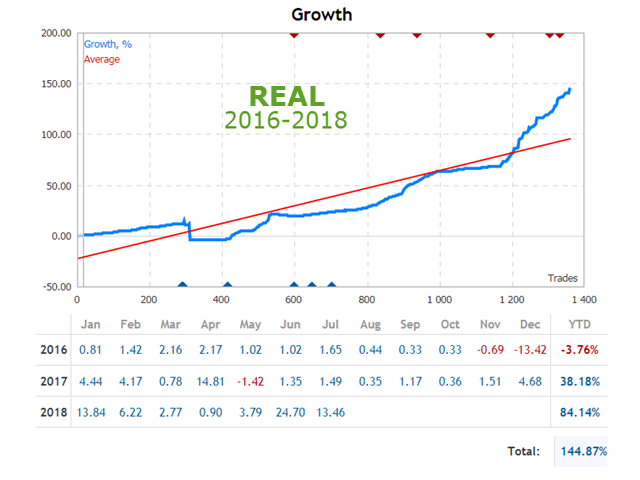 DistanceAverageSpred - O número de spreads do par de moeda para colocar ordens adicionais para a posição principal. TrailingStopaTickSpred - O número de spreads do par de moeda para o rastreio do lucro. Uma vez que o lucro da posição tornou-se maior do que ou igual a TrailingStopaTickSpred (em pontos), o sistema inicia o stop móvel. Com isso, o take profit é zerado. LotsMartin - aumenta o volume do próximo negócio adicional de acordo com o princípio de Martingale. Lots (0,01 .........) - Define o lote fixo para todas as negociações. Esse parâmetro define o volume para todos os negócios. O lote é fixo e aplicado a todas as ordens. Você precisa esclarecer o lote mínimo para uma negociação que é permitida pelo seu corretor. DynamicLot (true - false), LotBalancePcnt (em percentagem da margem livre). Estes parâmetros são destinados a ajustar o cálculo automático e definir o lote, dependendo do tamanho da margem livre. Você pode encontrar mais informações no artigoAutolot(Calculando o volume com base no balanço atual). OpenHour (em horas), OpenMinute (em minutos), CloseHour (em horas), CloseMinute (em minutos). Esses parâmetros são usados ​​para ajustar o intervalo de tempo de operação do Expert Advisor. Diante disso, este intervalo afeta apenas a abertura de novas posições. As funções de stop móvel trabalham independentemente do intervalo. OpenHour= 14, OpenMinute=0, CloseHour=18, CloseMinute =35. As negociações serão realizadas das 14:00-18:35; os sinais da estratégia será ignorado no restante do tempo. Este parâmetro é um stop loss para cada posição. Ele é especificado como o número de pontos perdidos. Uma vez em que ela é atingida, a posição é fechada pelo servidor. 0 - O parâmetro é desativado; e o stop loss será igual a 0. Este parâmetro deve ser definido para não menos do que o valor mínimo permitido no seu servidor. Caso contrário, o Expert Advisor irá mostrar o erro 130. Установил неделю назад на демо счете (5000 USD), на большое количество валютных пар с низким спрэдом. Советник открыл за это время 61 сделку (из них половина по паре евродоллар). Я в шоке, но 60 из них в плюсе, и только одна в минус! Большая часть сделок завершается с небольшим профитом по безубытку. Пока не разобрался, но в программе как-то можно увеличить этот небольшой профит, так как по истории часто цена ходила выше и можно бы было снять больший профит. Просадка счета не более 100 долларов при открытых сделках (обычно 2-3 сделки одновременно). Очень рекомендую. Llevo 2 dias con la versión demo en USDJPY y la verdad... me ha devuelto la confianza en esto... funciona muy bien en una cuenta pequeña... le doy hasta mañana viernes para decidir la compra del PRO, pero por ahora, MUY RECOMENDADA!!! I never thought that there is an EA that can empty an account in less than 2 hours.. Even my dog can trade better than this. I am using it for couple of weeks on demo account, looks good. EA opens order, and then either closes it with profit, either uses averaging to anyway close deal with profit, therefore balance drawdown is almost impossible. I had only one situation when ea closed deal with negative profit, but it regained losses back with next deal. Averaging can cause huge equity drawdown on certain conditions, so its better to have a lot of balance in reserve. No settings changed, everything by default. And looks like I don't need to adjust any settings at all. So, if you want to have no more than 10% equity drawdown - you should have 500 on your balance per each 0.01 lot. Income is around 10% per month in this case. Keep in mind that results are related for demo version, which does not autoadjusts to market situation like pro version. And supports only eurusd with default parameters. So, in my opinion PRO version will be much better, plus will allow to trade many pairs at the same time. 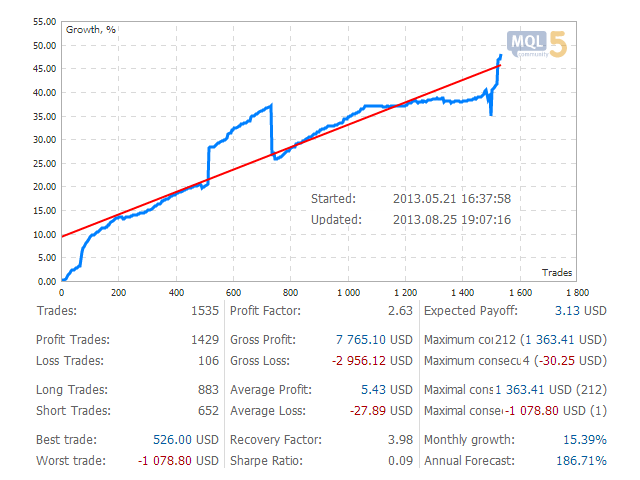 I will keep demo version for one more month to have better equity drawdown statistics, then go pro. Congratulations, Vladislav, this is amazing work! This free EA can trade on real account too, on any symbol, but you cannot change settings. And when equity drawdown reaches -10% - ea stops to open new trades at all, at the same time averaging stops too. So you should not use this free version on real account with small balance, or else lack of averaging may end your account. This is relevant only for demo version, full version will have possibility to change this setting. - Fixed the error of obtaining the average spread when opening a new bar on some currency pairs (when Ask and Bid = 0). Уважаемые друзья. Спасибо, что вовремя сообщаете об ошибках. Всем кто скачал эту версию для реального счета. -Added information about the ban on trade for various reasons.EA works on the movement of currency pair quotes. Upgrade the EAPADPRO to version 20. A new CUSTOM mode has been added to the LimitType type. You can specify your monitoring values ? ?in minutes, the LimitForCustom_Minutes parameter. Added the number of points till the next averaging. Indicated in brackets from the last opening price. Added the amount of commission and swap in points. False=0 - the EA does not close positions when the MA direction changes. OnlySignal=1 - when the MA direction changes, the EA closes only when one main signal position is open. There should be no averaging positions open. SignalAverage=2 - when the MA direction changes, the EA closes all positions, including averaging positions. Use the original calculation of commission and swap when enabling the functions: Breakeven, Trailing Stop, Averaging. The original commission calculation is based on the formula for calculating the value of 1 point from the open positions on a given symbol and magic number. Negative swap and commission are taken into account during calculations. The function returns the value of the negative swap and commission in points, and considers this when working with breakeven and trailing stop. Note: if your broker has a floating spread, commission is calculated and set during the operation of the breakeven and trailing stop functions, but the spread may increase, leading to additional loss points. This is not a calculation error! Also, note that when a swap occurs, the EA recalculates the breakeven line and sets new stop loss levels is the server allows it (restriction on the minimum Stop Level of your broker). If the server does not allow setting breakeven and returns the minimum stop level error, the EA will be unable to modify the position and additional loss points may be received. In order to avoid losses when using accounts with commission and when receiving a negative swap, it is recommended to increase the distance of the breakeven or trailing stop. The breakeven level (LevelWLoss/LevelWLossMANUAL) can be calculated manually, taking the commission into account. For example: commission for opening and closing position = 2 USD (EURUSD) per 1 lot. So, in order to cover the loss on the commission, it is necessary to set LevelWLossMANUAL = 2 (points) + 1 (confirming) = 3 points. Thus, the EA sets breakeven to +3 points, which in turn will cover the loss on the commission. When LevelWLossMANUAL = 0, the breakeven point is calculated based on the current spread. This allows making the breakeven level dynamic and closing with the minimum profit of 1 spread. If the position's profit increases, trailing stop comes into play. If LevelWLossMANUAL = 1, the EA will set breakeven to 1 point! - Updated the operation by bars, now the EA is able to perform multiple deals if a signal is repeated on 1 bar. - Fixed the trailing stop error when there are positions in different directions. 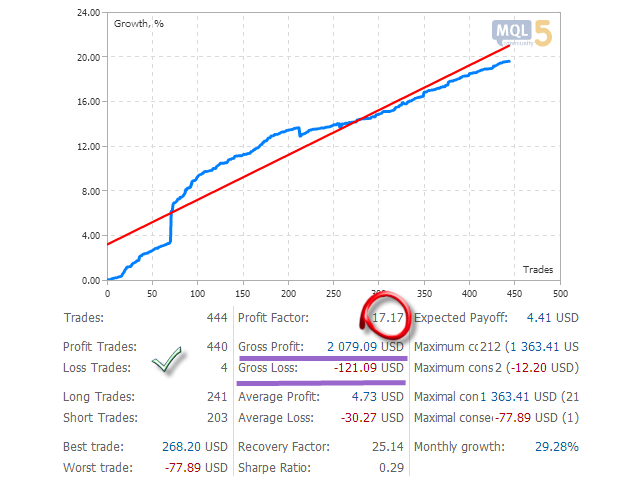 - Added the Set_StopLoss_to_the_next_profitable_position_level option. When enabled, this option monitors the open positions and transfers the stop loss to the next profitable levels. If the EA opens a BUY order, but the price moves against the position, 3 averaging positions are opened at the lower levels. Then, the price moves in the direction, but does not yet touch the middle line to activate the trailing stop. And if the price passes the opening level of lower position 2, the new option activates transferring the stop loss of the lowest position to the breakeven level. And if the price passes the level of the lower position 3, then the stop loss of the first position will be equal to the opening level of the position 2. And the stop loss of the position 2 = opening price of this position, and so on. If the price touches and goes down, the 2 positions will achieve breakeven and profit. Then the EA opens the averaging positions according to the algorithm again. But 2 profitable deals will be fixed. - Fixed the breakeven error that occurred in accounts where the stop level = 0. - Added the automatic spread level function. On accounts with commission, the EA may set too small levels due to the small spread. At the same time, the "Low" message will be displayed in the EAPADPRO dashboard. This function protects from using the EA on a small spread and allows to neutralize the difference between "normal trading" and trading on the accounts with the "small spread". 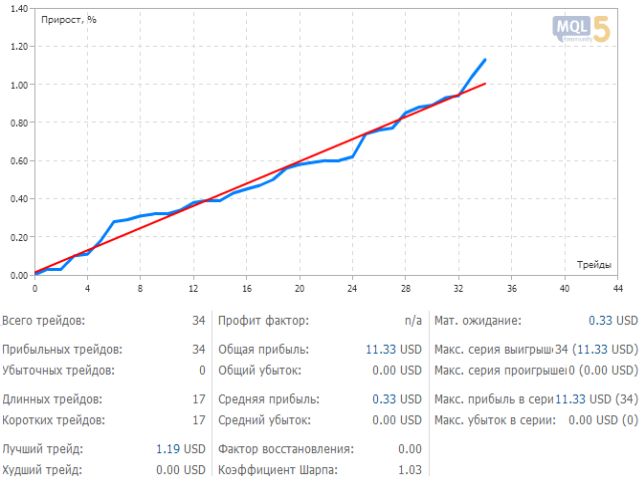 - Added the RiskRate parameter - the exchange rate of your currency against the USD. The default RiskRate = 0 means that the EA will attempt to find the correct exchange rate in the "Market Watch". For the autolot to work adequately with all currency pair, it is necessary to "Show all" currency pairs in the "Market Watch". - Improved the signal detection system. Fully revised the algorithm for obtaining signals. Note: During the first TimeToCheckAverageSpread/1000 seconds the EA does not trade, but collects information! This done to average the floating spread of your broker and to avoid false signals during significant fluctuations in the spread values. This option is disabled for fixed spreads. - Updated the calculation of averaging and the MaxOrders parameter for hedging accounts. 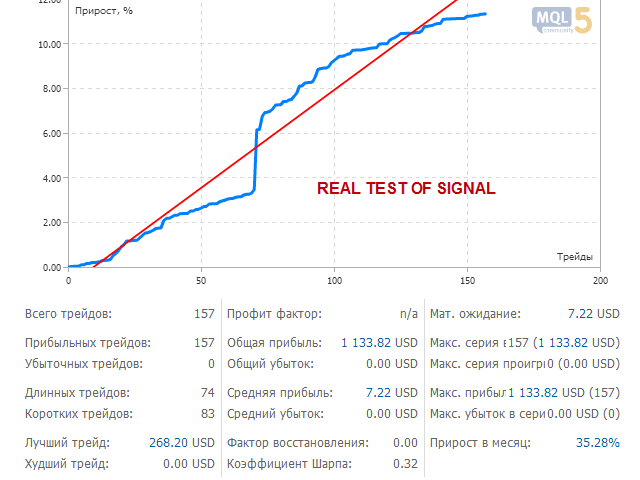 - Algorithm for signal calculations will be disabled when the trading time (Time Traiding) is disabled in order to increase the testing speed of the EA. - Modified the TrailingStep parameter. If TrailingStep =0, the TrailingStep = TrailingStop. This means that the trailing stop modification step will be equal to the trailing stop level in spreads. - Removed timer from the EA code, due to the unstable operation of the timer. - When using trading by time, the calculation of the signals logic is stopped at non-trading time in order to increase the algorithm operation speed. - Added the ReverseSignal parameter - reverses the strategy signals when enabled. - Added the Magic parameter (Other Settings block) - default values is -1 (for maintaining old positions without magic). If there are no existing positions, you may use a unique magic number. Note: if the position has averaging positions open, those positions will not be closed. DistanceTickMANUAL - set the signal distance in points. Code optimized in order to reduce CPU load. Added support for the EA operation on the Brazilian market. Added automated calculation of commission and swap in the Trailing Stop and Breakeven functions. Now Trailing Stop will only trigger when the position covers charged commission. Fixed MovingInWLUSE breakeven error, where Stop Loss could be ranging between the breakeven level and an activated trailing stop. The EA can work on Hedging and Netting accounts. Improved the operation of trailing stop and stop loss modification. (If the EA needs to open an averaging order and the MA is above the buy price, the averaging order is not opened). Added the Autolot selection mode. Added automatic detection of the order filling type. Set the default to MaxOrders = 5. The maximum number of averagings for the position = 5. New parameter Slippage - slippage in points during trade opening. If a server returns a requote on a signal, the trade will be skipped. New parameter CloseAllTradesbyOutofTime - all trades positions will be closed at the end of the trading time with Times options used. Algorithm for determining a trend - location of MA relative to the price. The MA period parameter is included in PeriodFilterMa settings. Added ability to work with any name of EURUSD symbol, including EURUSD.m. Manual Take Profit has been fixed. The minimum number of minutes until the next opening of an Averaging order! Useful for large candlesticks. Thus, we set a limit for the next order opening in minutes. Added option ModifyStoplossEverySeconds = 0. Modification of the Stop Loss at a new spread every specified amount of seconds. This allows you to modify the Stop Loss for a new spread. The value of at least 10 seconds is recommended, so that you are not banned by your broker for frequent stop loss midifications. If 0, the option is disabled. This modification is disabled when your position reaches breakeven. 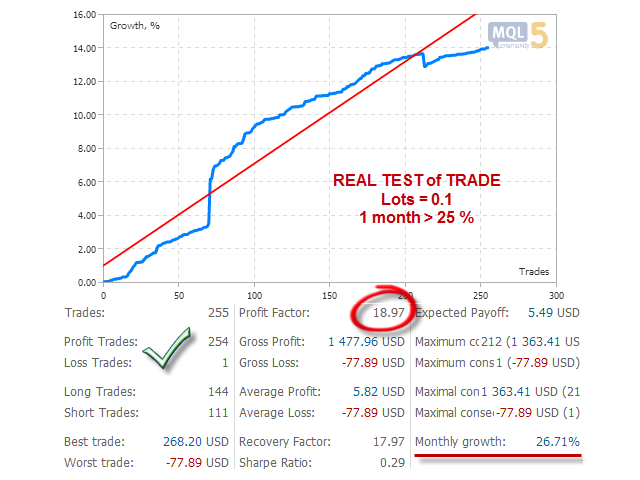 - set spread increase/decrease ratio for trade averaging from the initial DistanceAverageSpred value. DistanceAverageSpred_Koef = 2, DistanceAverageSpred = 50: the first averaging trade is performed at the distance of 50 current spreads. The second one is performed at the distance of 100 current spreads! - set averaging values in spreads separated by comma. "10,20,50,50,20,10" means that the first averaging trade is performed at the distance of 10 current spreads, the second one - 20 spreads, the third one - 50, etc. If three values of "10,20,30" are specified, all trade distances after the third trade are equal to 30. If you want to set fixed values, for example, for a stop loss, you may set StopLossMANUAL = 1 000 points. Or if you want to set fixed values of the averaging distance, you may set DistanceMANUAL = 100 points. Significantly increased the speed of the EA testing in the strategy tester. Fixed too long stop loss received during a too high spread leap (if the spread is increased 10 times, the stop loss is too big). Added the info panel to the chart the EA is launched at. Displayed signal volume and power. Added forced attempt of Stop Loss modification when opening a deal. Fixed variable "Maximum number of orders for averaging". In case of any error from the server, a comment is added in the Log. - Maximum number of orders during averaging. - Stop loss of every next deal is calculated on the basis of the open price of the last order instead of the current price. - Signals and variables of arrays containing signals are reset on start and every new day. - Signals are now detect only at non-rollback movements in the same direction. - SpreadToNotTrade - maximum spread for trades to be executed. If the current spread is greater than this value, the EA will skip signals. - PercentDDMAX - maximum drawdown of account equity at which the EA will start skipping signals for new trades. - NoNewPosition_below_MarginLevel - minimum margin in percentage at which the EA can make trades. If the margin falls below this value, the EA will skip new signals. - SecondsSleepEaAfterClose - sleep period in seconds. For the specified time after the last deal the EA will skip new signals. Once a position becomes profitable, its stop loss is moved to breakeven. The last deal and the timeframe are considered for averaging. Only one averaging can be used on 1 bar. If a position is closed with a loss, it will start with initial lot. The drawdown PercentDDMAX is calculated by all positions in the terminal. If a user open positions manually or using another Expert Advisor, those positions will be included in the calculation of drawdown. If the Trallingstop is less than the minimum level for modification allowed on the server, the minimum allowed value will be used. Amended the autolot function for brokers that have symbols with suffixes. For example, EURUSD.m. - SpreadToNotTrade - spread limit. If the spread exceeds this value, new deals won't be opened. 0 means the option is disabled. - PercentDDMAX - maximum drawdown by all symbols of the current account. If this value is reached, new deals will not be opened using signals. An exception is averaging deals. 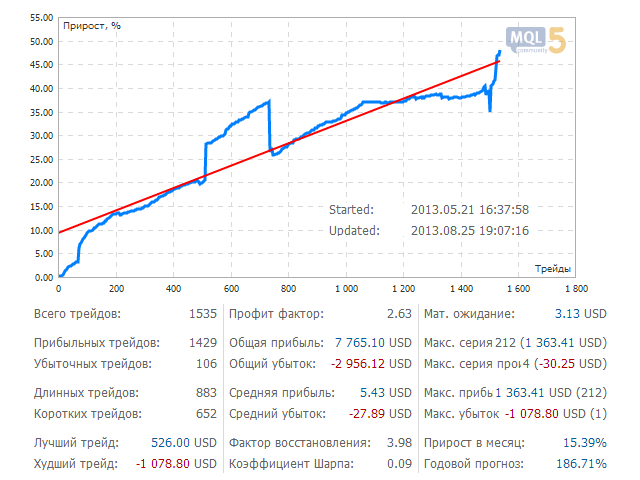 - StoplossTickSpred - number of spreads for the stop loss. When using initial trailing stop and a set of signals for modifying the stop loss, the initial stop loss is reset and the TrailingStop function starts working instead. 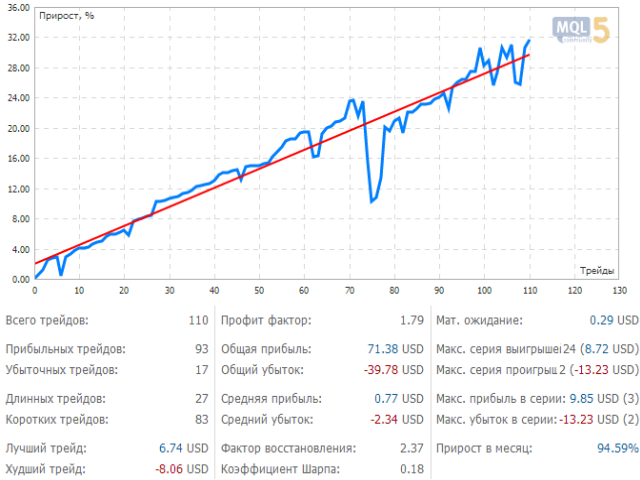 Changed the structure of defining Take Profit and Trailing stop (TrailingStopaTickSpred and TakeProfitTickSpred). To decrease the number of requests sent to the server, the parameters accept the current spread value only when the main deal is performed. The EA has been updated for the terminal's build. Added condition for trading time: if parameters remain unchanged, the EA works 24 hours. The EA is best suited for working at VPS server.